In one of the more confounding acts of cross-marketing one can think of, Harley-Davidson and Waterman got together to produce a group of pens with design elements reminiscent of motorcycles. Whether this was part of Harley’s efforts at gentrification or an effort by Waterman to both find a new market and gain an air of bad-boy appeal is not likely to be discovered. The whole line appears to have been based upon the Phileas, and some of the entries in it were pretty much just that pen with a cyclesque colour-scheme; yes, there was one with a flame-job. There were a couple of models which had special bodies made and the Horizon is probably the most extensively made-over of the bunch, looking as it does like the air-cooled cylinder of a motorcycle engine, with the valve pushers as the clip. The amendment to the body gives this model an interesting functional feature not usually found on Waterman pens. 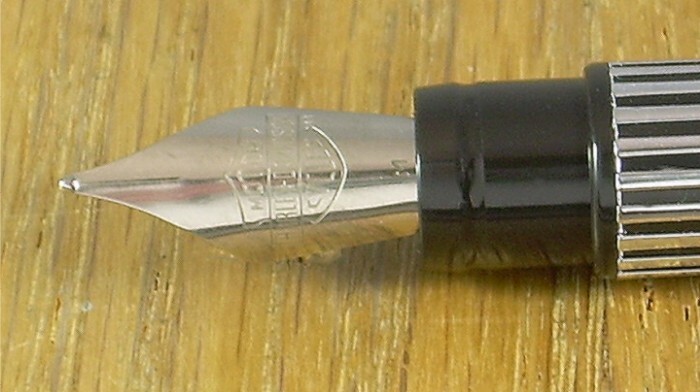 Like some Japanese pens aimed at the school market, it is possible to open the barrel and change the cartridge without removing the cap. Otherwise, point-to-paper performance is essentially the same as that of the Phileas, which means rather surprisingly smooth writing. I’m sure it’s all the more surprising in a novelty like this. As a result of the body modifications, this is an extremely heavy pen. While onlookers will get a giggle out of how it looks in use with the cap posted, and while the balance is not terrible, the combined weight begins to mash one’s hand. I recommend that comfort trump whimsy, and the cap be set to one side while the pen is in use. Production Run: It was in production for the 1999-2000 model year, but I’ve yet to track down the exact span of the run. Cost When New: $65.00 in a 1999 catalogue (for current value, try this calculator). Size: 14.1 cm long capped, 16.3 cm posted, 12.8 cm uncapped. Waterman Harley-Davidson Horizon. The barrel was also available in orange, red, blue and black. The joint is at the back of the lengthwise fluting. The branding extends to the point. 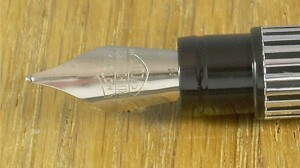 The cap also has the cycle company’s name more prominent than the pen maker’s. The box for the Horizon is shaped like a fuel tank, for extra fun. A single long cartridge is lodged under the instruction sheet. There were a variety of colours and decals on the “tank”, which is the sort of thing that gets collectors really revved up.